No. 2807 is owned by Cotswold Steam Preservation Ltd.
No new adverse comments against 2807, having operated on Saturday and Sunday last weekend. I say "adverse", because there is a comment that the nuts remain tight on the tender brake hangers. GWSR insist that the hangers must have split pins in the end of the suspension bolts such that there is no chance of the nuts coming loose and dropping off. meanwhile, they have to be inspected weekly. They're fine! Gilbert, John-G, Colin & Ann were working on the siphon. I was finishing off some boot scrapers. Then I decided to attack some of the rail chairs that are heavily contaminated with ancient grease. I managed to chisel it off 5 during the afternoon, and then apply the rotary wire brush to get rid of the last bits. These, of course, got their own back on me by showering my face, coat and shoes with oily black specs. Rain was threatened for the afternoon, so I started on cleaning rail chairs. However, David was already underneath 2807 doing more welding to the new ashpan bottom. The loco had been used last weekend, and all was well. David wanted to add more weld to the new lower portion on the outside. 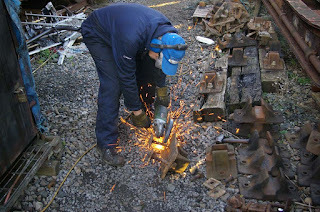 This is extremely unpleasant, because he had to stand in the pit beneath the loco and weld upwards. Furthermore, he added a strengthening angle-iron across the edge of the damper door opening's bottom to reduce the likelihood of the base bowing (which it had before). This was an all-day task for David, with Gilbert initially giving a helping had (or moral support). Bruce joined me, and together we cleaned up 14 rail chairs ready to convert 12 of them into boot scrapers. The other two? Well, beneath the inch-thick grease on one of them was an 1899 Midland Railway chair which I thought we might sell as-is via eBay, or something; the other is a Swindon-made GWR chair of some age (not sure of date of manufacture, as it only says GWR & SN & 92). There was a huge pile of "raw" chairs, some covered in grease and most with bolts through them (that needed cutting off). John decided to tackle this pile, and with Gilbert helping, every one of the forty-plus chairs was de-bolted and stacked neatly ready for prepping. What a fantastic effort. We also did some tidying up around our TPO (and I half-inched a July 1942 LMS chair from a nearby sleeper!). You can help us to maintain No. 2807 in working order by purchasing from our shop. Items are usually unique to us and so you can't get them anywhere else. See the "Our Shop" link just above this text. All reasonable care is taken in the preparation of this blog, but individual contributions are the responsibility of their authors. CSP Ltd can not be held liable for errors in this blog. The opinions expressed in this blog do not necessarily represent the opinions or policies of CSP Ltd unless so stated. The content of external web sites linked to from this blog is not the responsibility of CSP Ltd. Copyright Cotswold Steam Preservation Ltd. Picture Window theme. Powered by Blogger.